The small green space next to Sentry’s downtown building. We all got a reminder Nov. 4 of the good that can happen when citizens speak up and both government and business listen to them. The right thing just might get done. 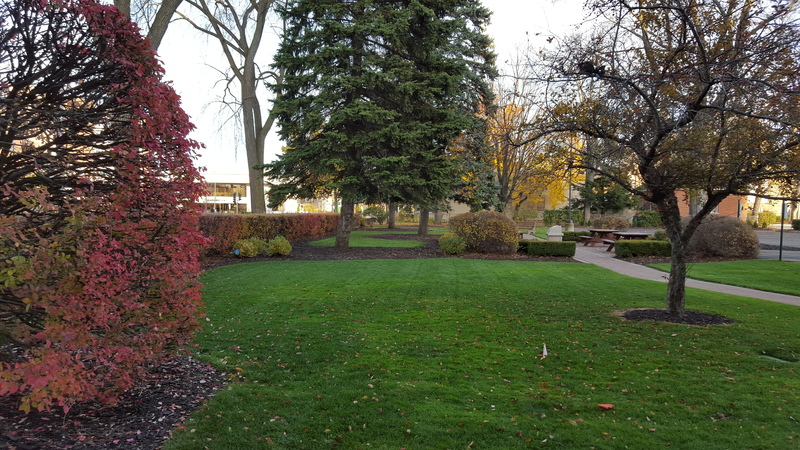 Big thanks are in order for both Sentry Insurance and the City of Stevens Point for examining an eminently reasonable solution to a proposal that could have killed off a small park downtown. The issue came before the Historic Preservation/Design Review Commission Nov. 4. Citizens argued that Sentry’s plan to add more parking to its lot on the 1200 block of Clark Street would take out a number of mature trees and probably the very best open, green space in the center of downtown.Having personally taken two prospective UW-Stevens Point faculty members on community tours in the last week, I can attest to the importance of green space and recreational activities to those considering life in Point. Both candidates asked primarily about two things during the tours – recreation and neighborhoods. Author’s note: this is my Nov. 12 Portage County Gazette column. I’ve been a little distracted lately by our faculty searches, and as chair of one of the committees I’ve had to put in a few 13-hour days this month working just on that. It’s got me a little behind; sorry about that. The Gazette is still not completely finished with its new web site, so here’s the whole column. The commission justifiably turned down the parking proposal, but instead of appealing the decision, Sentry appears ready to work with the city on an agreement to have spots set aside in a lot behind the AT&T building just to the west on Clark, a lot bounded by 3rd and Water streets. That’s a perfect solution, given that the lot already has spots set aside for a nearby alternative school, but still has plenty of space. In fact, it generally fills to no more than a third of its capacity, said Kyle Kearns, an associate developer with the city’s community development department. I took a quick jaunt over to the lot shortly before noon on Tuesday and confirmed that. Anybody can do so even more easily with a Google Earth view of the city. While other city or county lots nearby are much closer to full on the current Google view (although those lots too still have ample spots), the 3rd & Water lot is barely a quarter full. Kearns agreed that citizen input was important for Sentry, even if the company did take a little heat for its proposal. “They’ve been pretty nice and understanding with the remarks the public made,” Kearns said. Maybe some feathers were ruffled, but in the end, it looks like nothing gets plucked. For that, we should all be thankful. Citizens who want to make a difference can do so in several ways. Speaking out, as folks who helped save downtown green space did, is one way. Serving on local community boards is another, and for a park person, there’s an open spot. The Stevens Point Board of Park Commissioners meets on the first Tuesday of each month, said Tom Schrader, director of the city parks department, and from time to time has subcommittees to address issues or develop and promote special projects. The board is looking for one more member – “Someone who is interested in improving the quality of life for the residents of Stevens Point,” Schrader said. Applications for this spot, or any other open board or commission spot in the city, are available from the city’s web site at this link. Good traits for a commissioner, Schrader said, are someone who can be creative when there are limited funds to operate with; who has ideas for new programs, projects or facilities; and who is willing to help in fund raising. The commission is unusual in that its number of citizen members – eight, as opposed to three representatives from the city’s Common Council – is an unusually large proportion of private citizens to city officials, Schrader said. “It is a great commission to be on if you want to see your efforts truly improve someone’s quality of life,” he said. If you’re missing your daily fix of the Green Circle Trail because the Plover River Trail portion of it is temporarily closed, you realize how important this community treasure is. You may also know that it’s being resurfaced along that stretch – don’t worry, because it opens again on Nov. 14 – but you may not know that the trail can use your financial support. The 24.6-mile Green Circle, made up of 11 primary sections, is supplemented by 6.8 miles of other connections in three sections. All of it is made possible by the funding collected by the Green Circle Board of the Community Foundation of Central Wisconsin. Board president Bev Laska, who’s serving the last two months of her term before Nick Schultz takes over, said the biggest expense for the trail each year is maintenance of the trail surface. It usually occurs in the fall, when construction companies are winding down their work and are available to help. In addition to the Plover River project, Laska said the board has prioritized a partial rerouting of the West Side Loop to decrease the portion of paved road and to run closer to the new environmental charter school at the site of the former Jackson Elementary. The trail also will get some sort of refurbished kiosk in Pfiffner Park to replace the one informally known as the “founder’s kiosk.” It recognizes all of the initial contributors to the Green Circle, but its wood is now rotting and can’t hold the names of all contributors, she said. Eventually, the trail complex will have eight new kiosks ; the most recently completed was in the Village of Whiting at the west end of Cedar Street. It features a large overview map of the trail and signs helping interpret the natural and cultural history of the area. A donation from the Marshfield Clinic funded the kiosk, completed in August 2014. Laska said the board’s major annual fundraiser starts in late September with a mailing to previous contributors and other community residents, generally resulting in 500-600 donors before the end of the calendar year. Board treasurer Steve Menzel, who has served the board for eight years, says most of those donors give modest amounts, but generate between $30,000 and $40,000 annually. We’ve probably all got our pet peeves inconsiderate recreationists. When it comes to the Green Circle, mine is folks who walk or snowshoe on the groomed cross-country skiing portion of the Plover River Trail, destroying the skiing tracks. I have to work to keep those boneheads out of my mind when trying to ski the trail. Laska admits her biggest issue is folks with unleashed dogs, which aren’t allowed on the trail. Despite reminders on several signs on the trail (these rules signs are also due for refurbishment soon), many people still flout the prohibition against free-roaming dogs. Those dogs can frighten or even attack other dogs and frighten people as well. Laska recounted a recent incident in which she gently reminded a woman of the rules, and the woman inexplicably countered with an aggressive verbal retort – in front of the woman’s young daughter. “It’s a big problem, and we don’t know quite what to do about it,” Laska said. There may not be much we can all do except remind folks as gently as possible and hope they’re reasonable about it. Like speaking up in public meetings, it’s never easy, but probably necessary. Ending on a happy note: new chairs at Schmeeckle! Schmeeckle Reserve’s intricately carved wooden chairs now grace a new seating area at the head of the Trail of Reflections Loop. They are available to delight visitors and offer them yet another place to consider the charms and benefits of nature. Unveiled during the Halloween-weekend Candlelight Walk, the four massive chairs are carved with wildlife on the front and a continuing quotation spanning the backs of all four. The quote, from Confucius, was clearly a message sent to us across the centuries. While enjoying the Green Circle Trail, you would be wise to stop in Schmeeckle and sit for a while. Avoid bitter experience by reflecting on what a wonderful community we live in.